Three times ITU World Para-triathlon Gold Medalist Justin Godfrey, was in his early teens when a motorcycle accident resulted in his lower leg being severely damaged and after many years of trying to save his leg, Justin had to have his leg amputated. After being told he couldn’t do what others could, this became his driving force to “give everything a go.” After being introduced to Wheelchair Basketball and hurting his shoulder he discovered mountain biking, where he soon became addicted to the freedom that it offered and started competing in cross country and endurance MTB events. In 2012 he was approached by a local triathlon coach and this set him on the path to learning to swim, which was a challenge in itself as he had never swum competitively before and had most of his lat dorsi muscle removed in an operation attempting to save his leg. He had also never tried running since his amputation. After a series of many challenges including more operations, perfecting all three triathlon disciplines, and trials both on and off the field, Justin went on to have many successes including winning three World Para Triathlon gold medals. He puts much of his success down to the unwavering support of his beautiful wife and two amazing daughters who have been on this journey with him every step of the way. In 2015 he heard about Cross Triathlon which allowed him to couple his passion for Mountain Biking with triathlon and in February 2016 he was the first para triathlete to qualify to compete in the 2016 ITU World Cross Triathlon Championships in the Snowy Mountains, NSW, where he won gold. 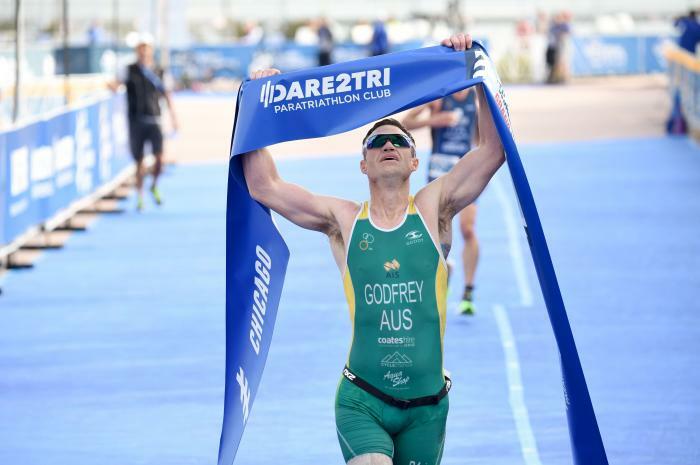 2017 brought two more gold medals, at the 2017 Devonport OTU Triathlon Oceania Championships and at the 2017 Gold Coast ITU World Paratriathlon Series.